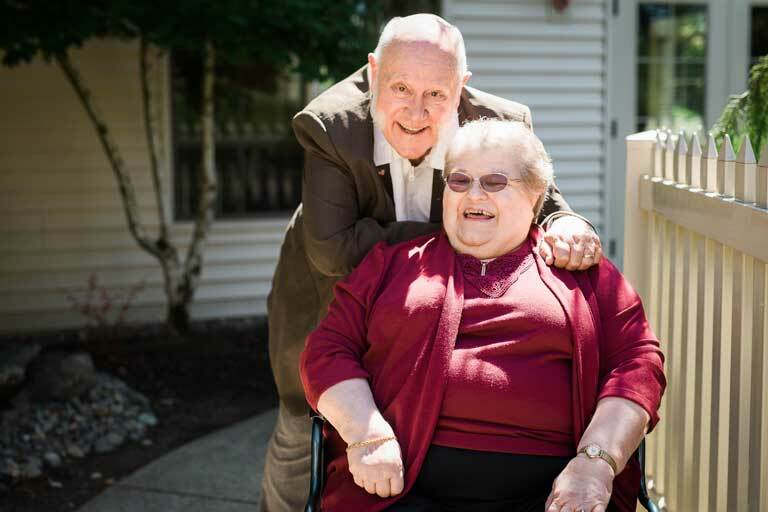 Jerry and Elaine Ramsey, both 76-year-old residents at Harbor Place at Cottesmore in Gig Harbor, Washington, are a perfect example of what true love looks like. Their favorite was sharing a hot chocolate and onion rings, which they still enjoy today. They were both 27 when they married in 1967. The couple sought careers in teaching, but also found they had a passion for writing and volunteering. Jerry pursued writing by submitting historical articles, shadow writing for books and, eventually, writing his own book, “Stealing Puget Sound 1832-1869,” exposing the tension in political history. Elaine, over the years, focused on teaching fifth and sixth grade. She also helped finish her grandfather’s autobiography, “Well Done, Good and Faithful Servant,” and later retired and volunteered at an election office. In 2002, Elaine had a bad episode with an illness. After Elaine’s health worsened, Jerry had to be at home more often to take care of her. Later, the couple moved to Harbor Place, after Jerry suffered a back injury and could no longer take care of Elaine by himself. Elaine, after approximately 30 different surgeries, is wheelchair bound and seldom talks, but Jerry says she still has a laugh of a person who understands everything that’s going on. Jerry and Elaine have been married for 49 years and are already looking forward to 50 together. Over the years, and still today, the couple is constantly learning new things. Over time, things have certainly changed for Jerry and Elaine, but they have found their way to keep connected: technology. Computers can be challenging for Jerry, but he enjoys writing and researching on their desktop computer. He has created a Facebook page and maintains his own website. Jerry is also starting a blog on his site, where he can talk about his book and the many articles he’s written. “I can sit there and look at my friend in North Carolina, like he’s in the room. We can talk with complete conversational ability, like we’re right across the table,” said Jerry. Jerry and Elaine also keep connected by giving back to the community through various endowments. Most importantly, their zeal for life and passion for literature is a gift they willingly share with friends and family near and far.